The Kellogg School turns 100 this year and is planning a once-in-a-lifetime birthday party. The Centennial gala, which will be hosted in Chicago's Museum of Contemporary Art, is scheduled for Oct. 10. This mix of prestigious academic history with au courant artistic innovation may seem unusual, but the symbolism is fitting, says Kellogg Dean Dipak C. Jain. After all, the school's leadership lessons are cutting-edge and creative. "We have a great tradition whose roots go back a century, but the strength of our curriculum is that it remains contemporary — very much up to the moment as we cultivate global leaders prepared for the challenges of the next century," Jain says. "We regard leadership as both an art and science." The location of the celebration — a black-tie dinner whose guests will include luminaries from Chicago's business, education and municipal community — is appropriate for another reason too. Chris Kennedy '94, the Kellogg graduate chairing the event, has stepped into the art world, embellishing a résumé that already boasts stellar business credentials and a political pedigree connected to one of America's famous families. Kennedy, 44, is president of Merchandise Mart Properties Inc. (MMPI), the Chicago-based trade show and property management company that oversees several commercial enterprises, including the L.A. Mart in Los Angeles, the Boston Design Center in Boston and the iconic 4.2-million-square-foot Merchandise Mart in Chicago. The Mart, which opened in 1930 and was owned by the Kennedy family from 1945 until 1998, is the largest commercial building in the world, spanning two full city blocks and home to over 600 showrooms. In 2006, MMPI rescued the faltering 13-year-old Art Chicago, one of the leading contemporary art fairs. Since then, MMPI, a subsidiary of Vornado Realty Trust, has purchased other major shows, including Volta Basel, the Armory Show and the Toronto International Arts Fair. It's a move that Kennedy — son of the late Robert F. Kennedy — finds synergistic, since he has long seen the connections among art, politics and business. For one, he says, they all rely on relationships to thrive. As a teenager working on his uncle Ted Kennedy's 1980 presidential bid, he saw that artists like Warhol and Rauschenberg would donate some of their work to the campaign. And while the art world tends to dip along with commerce during an economic downturn, Kennedy says he's not taking a "quarter-to-quarter approach" to things, but is willing to ride out some of the normal market fluctuations. That perspective is one he says can help enterprises excel for the long-term. As evidence, he points to the qualities that, for decades, have made the Kellogg School and Merchandise Mart exemplary institutions. "Both contribute an awful lot to Chicago," Kennedy says. The Merchandise Mart is in the business of producing tradeshows, he adds, "and trade shows are really incubators." Kennedy says that companies who participate in a show often find that if they do well in the Windy City then their company will thrive. They may subsequently set up a local office, which can bring new business to Chicago. "I think the same thing is true with Kellogg: It's an incredibly efficient economic engine for the region," Kennedy says. "I don't know many other organizations that attract hundreds of future leaders to our city to spend a year or two here, to see the wonders of the lakefront, to see how nice the people are, see how livable this city is and understand that we have a well-educated workforce." Kennedy himself relocated to Chicago from Boston, where he had earned an undergraduate degree in political science from Boston College. He began his Kellogg tenure as a student in the Full-Time MBA Program before transferring into the part-time curriculum, an arrangement that let him pursue his career at the Merchandise Mart, where he had interned. He admits that juggling work and school proved challenging but says that he made "lifelong friends during the day program" while also enjoying valuable interaction with colleagues from the business community who were enrolled in the evening program. "I would say that very few students got as much out of Kellogg as I got out of it," Kennedy says. "I focused on history and political science during my undergraduate years at Boston College and I came to Kellogg highly motivated but with little grounding in subjects like finance or accounting or operations, so the experience was all upside for me and it was tremendous." 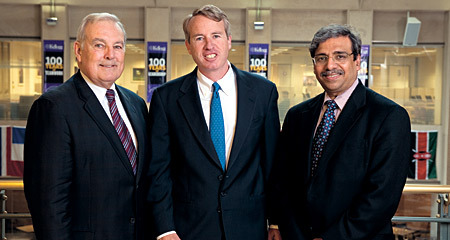 Kennedy recalls "great teachers" at Kellogg, including Robert Dewar, associate professor of management and organizations, and the late Lawrence "Gene" Lavengood, a popular business historian and ethics expert whose influence Kennedy says has shaped his own leadership insights. "He helped me develop my basic approach to all things that have occurred in the business of the Mart," Kennedy recalls. "We're in scores of industries and lots of different businesses. Every one of them we approach with the philosophy that really came out of Lavengood's class: 'What's your mission and how are you going to do it?'" Dewar's insights into organizational philosophy also have made an impact Kennedy says — including in the company's ability to execute on a commitment to green design and practice. In 2007, the Merchandise Mart earned a LEED Silver certification for existing buildings, a "super technical" feat that "involves a lot of basic science and massive organizational change," which was made possible because the company was able to "attract, retain and motivate top-notch talent," Kennedy says. Its ability to do so, he adds, was partly the result of the organizational philosophies he learned at Kellogg. "Bob Dewar made it clear that working with a team and motivating those people was critically important to the continuity of an organization. These were some of the issues that were first raised in my mind at Kellogg 15 years ago." In appreciation for his Kellogg experience, Kennedy is pleased to play a role in producing the Centennial gala. He sees the business school as a force for economic development in Chicago. "I think Dean Jain is trying to tap into the Kellogg resources in order to improve our city and community," Kennedy says. "Kellogg is entering a phase where, because of its global reputation and accomplishments, it's able to contribute even more fully to the community in which we live. I'm happy to be supportive of that." In addition to the gala, Kellogg will celebrate its Centennial from October through May 2009 with social events and academic conferences at various locations around the world, including London, Zurich, Shanghai and Mexico City. These events will look ahead, outlining a vision for the role that Kellogg will play in advancing management education in the coming decades, while also reflecting on the school's century of accomplishment. The Kellogg School began in 1908 as a part-time evening program located in Chicago's Loop. Known then as the School of Commerce, it offered an attractive curriculum to students — often employed by area banks or retailers — who were looking to improve their professional circumstances through business education with a practical focus. Among the school's early strengths were advertising and marketing courses built on the strong economic orientation of faculty members, including the school's first dean, Willard E. Hotchkiss. For more information about Kellogg Centennial, contact Jane Rodriguez at 847.467.2586, or visit centennial.kellogg.northwestern.edu.